Try our satisfaction guarantee - compare our topaz quality and our prices. Imperial Topaz Dimensions: 1.3" x 1.1" x 0.7"
This natural color imperial topaz was unearthed at Ouro Preto, Brazil. This genuine imperial topaz specimen is a partially terminated topaz crystal with some abraded areas. It has natural strong golden orange color under incandescent light as shown. This lightly included imperial topaz specimen is transparent with several small gem-grade areas. See an opposite side view of this natural color imperial topaz specimen. See also an end view of this genuine imperial topaz specimen. Imperial Topaz Specimen Dimensions: 1.8" tall x 1.7" wide x 1.2"
This rare size natural color imperial topaz specimen was unearthed at Ouro Preto, Brazil. See another view of this rare size imperial topaz. This genuine imperial topaz is a partially terminated topaz crystal with some abraded surfaces and rich natural golden-orange to reddish-orange color under incandescent light. See also an opposite side view of this natural color imperial topaz crystal. This imperial topaz specimen is semi-transparent to transparent. See also a back-lit opposite side view of this natural imperial topaz crystal. Blue Topaz Specimen Dimensions: 2.1" long x 1.4" x 1.1"
This specimen of semi-transparent to transparent natural topaz has pale blue natural color. It has not been heated or treated in any way. It is a partially terminated topaz crystal with some broken areas and some naturally etched surfaces as shown in the close-up photo at left. See a full view image of this natural blue topaz mineral specimen. See also another view of this genuine natural blue topaz mineral specimen. This beautiful topaz specimen is unheated and untreated. Blue Topaz Specimen Dimensions: 2.3" long x 1.7" x 1.1"
This specimen of semi-transparent to transparent natural topaz has pale blue natural color! It has not been heated or treated in any way. This natural topaz mineral specimen is a partially terminated topaz crystal with mostly broken surfaces. Topaz Mineral Specimen Size: 2.7" long x 2.1" x 0.7"
This specimen of transparent natural topaz has strong blue natural color. It has not been heated or treated in any way. This topaz specimen is a very fine and rare quality blue topaz mineral specimen just as it is, and it also has very fine transparency inside and would yield over one hundred carats of lightly included cabochon gems with natural blue color. This natural topaz specimen has a relatively thin flat shape, the bottom surface is cleaved flat and the sides and upper surfaces are covered with very interesting natural etchings. 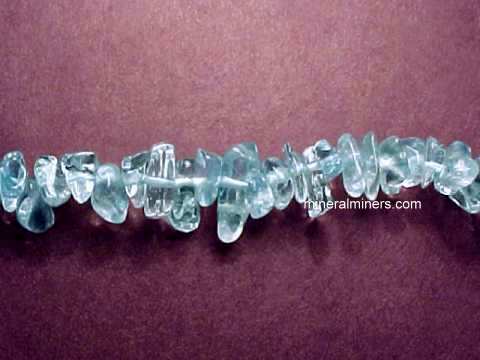 See a side view image of this naturally etched blue topaz mineral specimen. See also a close-up view of this natural etched blue topaz mineral specimen. Topaz Mineral Specimen Size: 2.5" long x 1.7" x 1.5"
This specimen of transparent natural topaz has light blue natural color. It has not been heated or treated in any way. This topaz specimen is a very rare quality natural blue topaz mineral specimen just as it is, and it also has very fine transparency inside and would yield a few hundred carats of lightly included gems (or a wonderful carving!) with natural blue color. 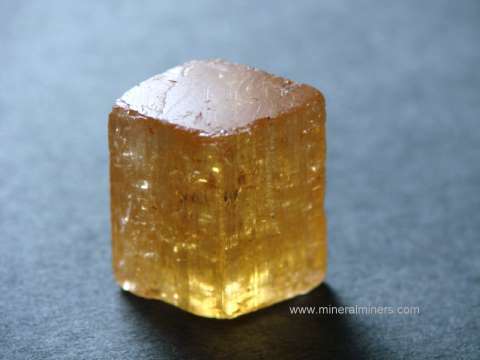 This natural topaz specimen has a relatively blocky shape with one broken side and the remaining surfaces are covered with very interesting natural etched terminations. There is a small amount of tan color mica on some surfaces. See another image of this natural color blue topaz mineral specimen. See also a different view of this natural color blue topaz specimen. Topaz Crystal Dimensions: 2.5" x 2.3" x 1.7"
This naturally terminated topaz crystal specimen is colorless and weighs 0.63 pounds. It is transparent with partially etched prismatic faces and terminations in very good condition. It has not been heated or treated in any way. See also another full view image of this large topaz crystal. Topaz Crystal Dimensions: 3.2" tall x 2.6" x 1.75"
This naturally terminated topaz crystal is almost colorless with very pale golden natural color, and it has very good transparency. This fine collector quality topaz crystal has not been heated or treated in any way. The prismatic faces and terminations are in very good condition. See also an opposite side view of this large topaz crystal. 5.2" long x 2.1" x 0.9"
This naturally terminated topaz specimen is colorless with excellent transparency. It has not been heated or treated in any way. This topaz crystal has partially etched prismatic faces and terminations in very good condition. See a close-up view of the naturally terminated tip of this etched topaz crystal. See also another full view image of this large topaz crystal. Blue Topaz Specimen Dimensions: 4.3" long x 3.8" x 2"
This partially terminated natural topaz crystal specimen weighs 1.5 pounds and has pale blue natural color zoning. This beautiful topaz specimen has not been heated or treated in any way. The upper portion is covered with naturally terminated crystal faces. This topaz specimen is transparent with some internal rainbow reflections. 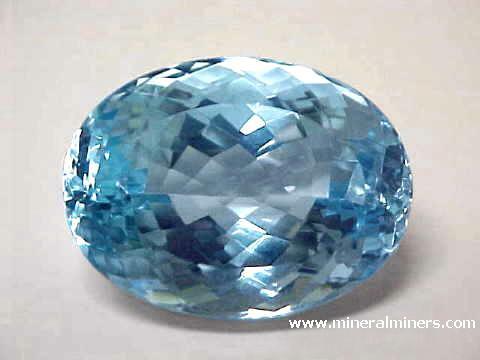 It makes a wonderful specimen of natural color pale blue topaz. See also an opposite side view of this large size topaz crystal specimen. 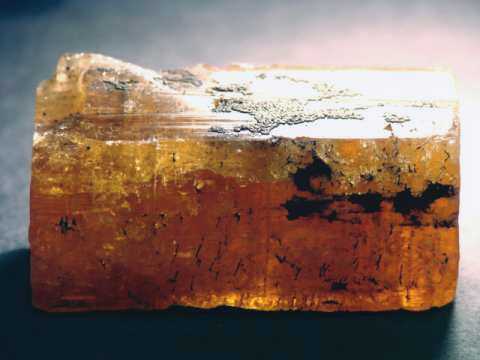 The bottom surfaces are broken - see a bottom view of this large topaz mineral specimen. See also another view of this topaz crystal specimen. 4.9" long x 3.5" x 2.1"
This partially terminated natural topaz crystal specimen weighs 1.59 pounds and has light blue natural color zoning! This beautiful topaz specimen has not been heated or treated in any way. It has some crystal faces and some broken surfaces. The photo at left was taken under incandescent light. This topaz specimen has good transparency. It makes a very nice specimen of natural color blue topaz just as it is, although it would yield a wonderful carving weighing over 2000 carats! See also an opposite side view of this large size natural blue topaz specimen. Topaz Specimen Dimensions: 3.6" x 2.3" x 1.4"
This partially terminated natural topaz crystal specimen weighs 0.47 pounds. 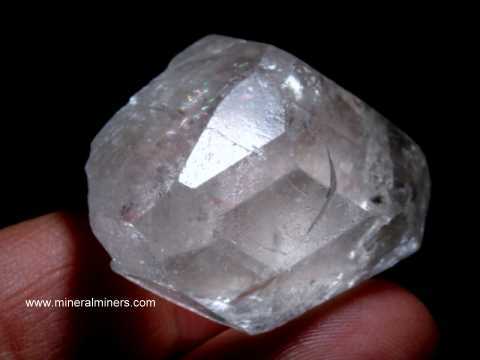 It has very fine transparency with lots of facet grade areas inside - it would also make a wonderful carving, although it does make a very nice specimen of very pale natural topaz just as it is! It appears colorless at a glance, but actually has very pale greenish-blue natural color. The upper surfaces show terminations and prismatic faces in very good condition with vitreous luster. Some of the back surfaces are broken and some are naturally etched with very interesting natural geometric patterns. See also a close-up view showing a back surface of this naturally etched topaz crystal specimen. See also another photo of some naturally etched terminations on this spectacular etched topaz crystal. This rare quality topaz specimen has not been heated or treated in any way. Topaz Crystal Dimensions: 3.3" x 3.2" x 2.2"
This naturally terminated topaz crystal weighs 1.25 pounds and has areas with natural blue color. This rare collector crystal has very good transparency with a very large facet grade area inside that would yield a 300+ carat flawless gem! It would also make a wonderful carving, although this large topaz crystal does make a fine specimen of natural color blue topaz just as it is. This topaz has natural color zoning ranging from pale golden-yellow color in most areas to some areas showing light to medium blue color, and these colors are completely natural! This natural topaz crystal specimen has not been heated or treated in any way. See also a close-up view of this natural color blue topaz crystal. See also a side-view photo of this beautiful natural color blue topaz crystal. This rare imperial topaz gemstone egg stands 2.6 inches tall. It was handcrafted from a natural precious topaz crystal that was mined in Russia. This genuine topaz egg is semi-transparent, and it has golden-orange color with pink-orange tones under incandescent light as shown in the photo at left (100% natural color - unheated and untreated). 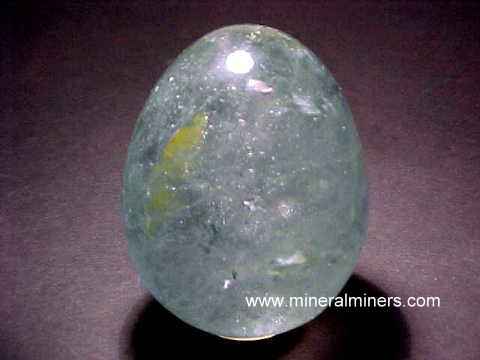 This natural topaz gemstone egg has a very nice quality finish. 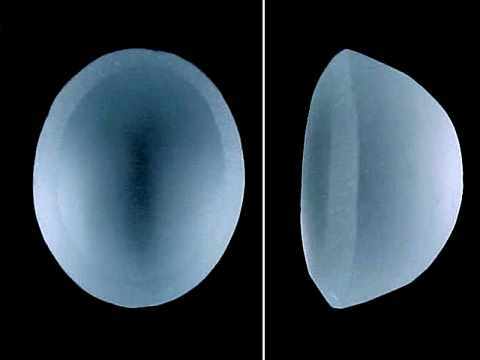 This ultra rare gemstone egg weighs 1841.1 carats! It was handcrafted from a natural blue topaz crystal that was mined in Russia. This lightly included egg is semi-transparent to transparent with small facet-grade areas, and it has light to medium blue color (100% natural color - unheated and untreated). This genuine topaz gemstone egg has a very fine quality finish. This rare gemstone egg was handcrafted from a natural precious topaz crystal that was mined in Russia. This lightly included egg is transparent which is extremely rare in this large size! It is bi-color with light golden-pink-orange color areas and light blue areas (100% natural colors - unheated and untreated). These natural color zones mix at different angles into shades of blue, gold and green. This incredibly rare quality genuine topaz egg has a very fine quality finish. Dark Orange-Red-Brown Topaz Egg, 2.1Lbs! This spectacular gemstone egg was handcrafted from a natural color precious topaz crystal that was mined in Russia. This extremely rare size museum quality egg is semi-transparent with very rich dark reddish-brown color under daylight and with orange-red-brown color under incandescent light (100% natural colors - this genuine topaz egg is unheated and untreated). This wonderful egg also has some beautiful rainbow reflections inside in some areas, see another view of this large topaz egg. This natural imperial topaz gem has fine golden-orange color under under daylight. Under incandescent light it has richer deeper orange color with slightly reddish-orange hues as shown at left (100% natural color, this natural color imperial topaz gem is unheated & untreated). It is well cut with good brilliance. This fine quality imperial topaz gem is completely clean to the eye (GIA: Type 1 Gem, VVS Clarity). This beautiful gem was faceted from a natural imperial topaz crystal that was mined at Ouro Preto, Brazil. Our mineralminers.com special offer price for this natural imperial topaz gem is $360./carat = $864. This excelent color and quality, large imperial topaz gem has very rich medium deep orange color under daylight. Under incandescent light it has fine deep-orange color with reddish flashes when turned to different angles (100% natural color, this rare gem is unheated & untreated). This fine quality natural imperial topaz gem is well faceted and proportioned in a pear shaped cut. It is completely clean to the eye with very faint natural inclusions visible only under close inspection at very high magnification. ( GIA: type I gem, Flawless). It was faceted from a natural imperial topaz crystal that was mined at Ouro Preto, Brazil. See also a side view of this imperial topaz gemstone. Our mineralminers.com special offer price for this fine natural color imperial topaz gem is $5400.00. This excelent color and quality, large imperial topaz gem has very rich deep orange color under daylight. Under incandescent light it has fine deep-orange color with deeper orange flashes when turned to different angles (100% natural color, this rare gem is unheated & untreated). This fine quality natural imperial topaz gem is well faceted and proportioned in a long cushion cut. It is completely clean to the eye with very faint natural inclusions visible only under close inspection at very high magnification. ( GIA: type I gem, Flawless). It was faceted from a natural imperial topaz crystal that was mined at Ouro Preto, Brazil. See also a side view of this imperial topaz gemstone. Our mineralminers.com special offer price for this fine natural color imperial topaz gem is $5795.00. This excelent color and quality, long imperial topaz gem has very rich medium deep pinkish orange color under daylight. Under incandescent light it has fine deep-orange color with reddish flashes at the ends when turned to different angles (100% natural color, this rare gem is unheated & untreated). This fine quality natural imperial topaz gem is well faceted and proportioned in a long cushion shaped cut. It is completely clean to the eye with very faint natural inclusions visible only under close inspection at very high magnification. ( GIA: type I gem, Flawless). It was faceted from a natural imperial topaz crystal that was mined at Ouro Preto, Brazil. See also a side view of this topaz gemstone. Our mineralminers.com special offer price for this fine natural color imperial topaz gem is $3556. This deep lavender-pink imperial topaz gem was faceted from a natural imperial topaz crystal that was mined at Ouro Preto, Brazil. This gem originally had natural orange-pink color, and it was then carefully heated to remove the orange color component, leaving only the natural lavender-pink color. This fine quality lavender-pink topaz gemstone was well cut with good brilliance. This small, but rare color gem is completely clean, with no visible inclusions to the unaided eye. See also a side view of this topaz gemstone. See also a day light view of this topaz gemstone. See also another side view of this topaz gemstone. The special sale price on this gem topaz is $480.00. This excelent color and quality, small imperial topaz gem has very rich medium deep orange color under daylight. Under incandescent light it has fine deep-orange color with reddish orange flashes when turned to different angles (100% natural color, this gem is unheated & untreated). This fine quality natural imperial topaz gem is well faceted and proportioned in a pear shaped cut. 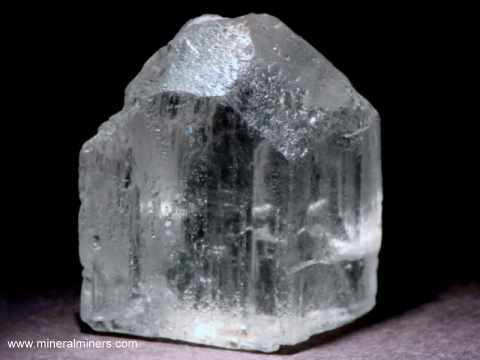 It is completely clean to the eye with very faint natural inclusions visible only under close inspection at very high magnification ( GIA: type I gem, Flawless). It was faceted from a natural imperial topaz crystal that was mined at Ouro Preto, Brazil. See also a side view of this imperial topaz gemstone. Our mineralminers.com special offer price for this fine natural color imperial topaz gem is $988.00. These golden imperial topaz earrings are set in 14k gold studs with natural imperial topaz oval cut gemstones with rich golden 100% natural color - these natural topaz gems are unheated and untreated. These beautiful imperial topaz gems weigh 1.77 carats total weight. These superior quality gems are eye clean even under very close inspection. They were faceted from natural imperial topaz crystals mined at Ouro Preto, Brazil. These 14k white gold stud earrings are set with natural golden imperial topaz gemstones (100% natural color - unheated and untreated). The beautiful gems in these genuine golden topaz earrings are eye clean. They were very well faceted with good brilliance from a natural imperial topaz crystal mined at Ouro Preto, Brazil. These 14k white gold stud earrings are set with natural golden imperial topaz gemstones with 100% natural strong golden color - they are unheated and untreated. These fine quality gems are completely eye clean even under close inspection! 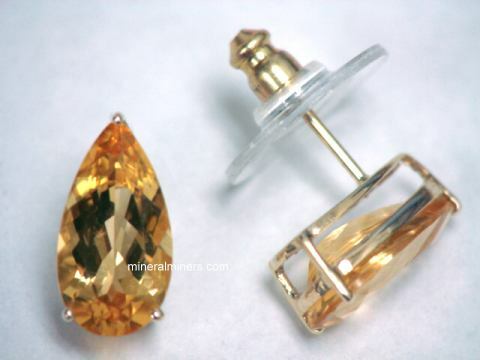 They are very well faceted with very good brilliance from a natural imperial topaz crystal mined at Ouro Preto, Brazil. See also a side view photo of these natural color golden topaz earrings. These 14k yellow gold stud earrings are set with natural imperial topaz gemstones with 100% natural strong golden-orange color - they are unheated and untreated. These beautiful gems are completely eye clean. They were very well faceted from a natural imperial topaz crystal mined at Ouro Preto, Brazil. This small size pair of golden topaz earrings is set in 14k white gold studs with natural golden-orange topaz gemstones with 100% natural golden-orange color - they are unheated and untreated. These genuine imperial topaz gems are eye clean, and they are very well cut. They were faceted from a natural imperial topaz crystal mined at Ouro Preto, Brazil. 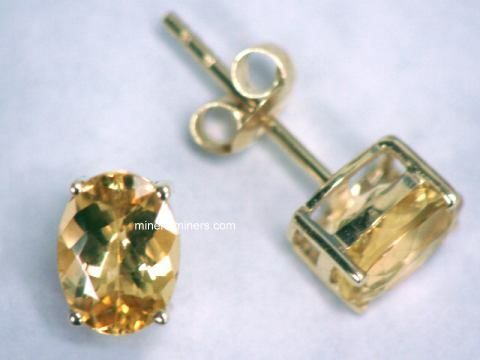 See also a side view photo of these natural color imperial topaz stud earrings. This pair of solid 14k white gold lever back earrings are set with natural color golden-orange topaz gemstones (100% natural color - they are unheated and untreated). These natural topaz gems are completely clean even under very close inspection. They were well faceted from natural imperial topaz crystals mined at Ouro Preto, Brazil. The photo at left shows a close-up view, see also a full view photo of these natural imperial topaz earrings. This pair of imperial topaz earrings is set in solid 14k yellow gold lever backs with natural color golden-orange topaz gemstones weighing 6.7 carats total weight (3.35 carats each gem). These fine quality topaz gems are completely clean even under very close inspection! They have 100% natural color - they are unheated and untreated. These genuine topaz gems are well cut from natural imperial topaz crystals mined at Ouro Preto, Brazil. The photo at left shows a close-up view, see also a full view photo of these natural imperial topaz earrings. This pair of solid 14k yellow gold lever back earrings are set with natural color golden-orange topaz gemstones weighing 4.80 carats total weight (2.40 carats each gem). These superior quality topaz gems are eye clean. They have a few very faint natural inclusions which can only be seen under close inspection with bright illumination. The natural inclusions absolutely guarantee their natural color and natural origin. They have 100% natural color - they are unheated and untreated. These genuine topaz gems are were faceted from natural imperial topaz crystals mined at Ouro Preto, Brazil. The photo at left shows a close-up view, see also a full view photo of these natural imperial topaz earrings. These 14k yellow gold stud earrings were set with natural color imperial topaz gemstones with beautiful golden-orange color (100% natural color - they are unheated and untreated). These fine quality natural imperial topaz gems are totally clean under very close inspection! They were well faceted with good brilliance from natural imperial topaz crystals mined at Ouro Preto, Brazil, and they weigh 2.15 carats each! This pair of imperial topaz earrings is set in 14k yellow gold studs with natural imperial topaz gemstones with pink color. These genuine imperial topaz gems show fine pink color! These beautiful gems face up eye clean, and they are very well cut with very good brilliance. They were faceted from a natural imperial topaz crystal mined at Ouro Preto, Brazil. See also a side view photo of these genuine pink imperial topaz earrings. This pair of solid 14k white gold lever back earrings are set with natural color golden-orange topaz gemstones with slightly orange pink hues (100% natural color - they are unheated and untreated). These natural topaz gems are eye clean, and they were faceted from natural imperial topaz crystals mined at Ouro Preto, Brazil. 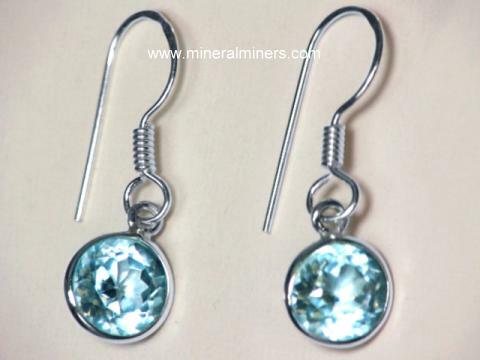 The photo at left shows a close-up view, see also a full view photo of these natural color topaz earrings. These 14k yellow gold stud earrings were set with natural color imperial topaz gemstones with rich golden-orange color (100% natural color - they are unheated and untreated). These natural imperial topaz gems are completely clean even under very close inspection. 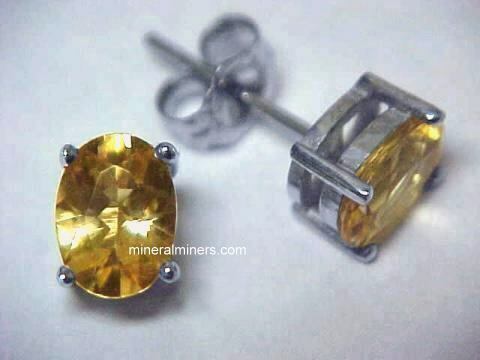 They were well faceted with good brilliance from natural imperial topaz crystals mined at Ouro Preto, Brazil. These golden-orange imperial topaz earrings are set in 14k gold studs with natural imperial topaz oval cut gemstones with very rich golden-orange color (100% natural color - these natural topaz gems are unheated and untreated). These beautiful imperial topaz gems weigh 4.10 carats total weight! These superior quality gems are eye clean even under very close inspection. They were faceted from natural imperial topaz crystals mined at Ouro Preto, Brazil. This pair of imperial topaz earrings is set in 14k yellow gold studs with natural golden-orange imperial topaz gemstones with 100% natural color - they are unheated and untreated. Under incandescent light these genuine imperial topaz gems show slightly pinkish-orange hues. These eye clean gems were well cut with good brilliance from a natural imperial topaz crystal mined at Ouro Preto, Brazil. This 14k yellow gold pendant was set with a natural imperial topaz gemstone with rich golden color (100% natural color - this genuine topaz gemstone is unheated and untreated). This fine quality gem is completely clean even under very close inspection! It was very well faceted with good brilliance from a genuine imperial topaz crystal mined at Ouro Preto, Brazil. This 14k white gold imperial topaz pendant is set with a natural imperial topaz gemstone weighing 3.26 carats, and with a 3.4mm round natural G VS diamond weighing 0.18 carats! The entire pendant is 24.5mm long (0.96 inches long). The color of the topaz is a beautiful golden-yellow natural color. This unique imperial topaz gemstone is unheated and untreated, it will make a very fine golden topaz necklace. The natural color imperial topaz gem in this pendant faces up completely eye clean, and it was faceted from a genuine imperial topaz crystal mined at Ouro Preto, Brazil. See also a side view photo of this genuine golden topaz pendant. This 14k yellow gold imperial topaz pendant is set with a natural imperial topaz gemstone weighing 0.68 carats with golden-orange natural color showing slightly pink-orange hues under incandescent light, and with a 0.05 carat round faceted diamond! The natural color golden topaz gemstone is unheated and untreated, and it will make a very special golden imperial topaz necklace! The natural color imperial topaz gem in this pendant is eye clean. This beautiful topaz gem was very well faceted from a genuine imperial topaz crystal mined at Ouro Preto, Brazil. This 14k white gold imperial topaz pendant is set with a natural imperial topaz gemstone weighing 1.02 carats. The color is a light purple-pink at the top of the gem which grades into light pink in the middle and then to light orange-pink at the bottom. This unique imperial topaz gemstone will make a very special imperial topaz necklace! The one-of-a-kind pink imperial topaz gem in this pendant is eye clean. This beautiful topaz gem was very well faceted from a genuine imperial topaz crystal mined at Ouro Preto, Brazil. 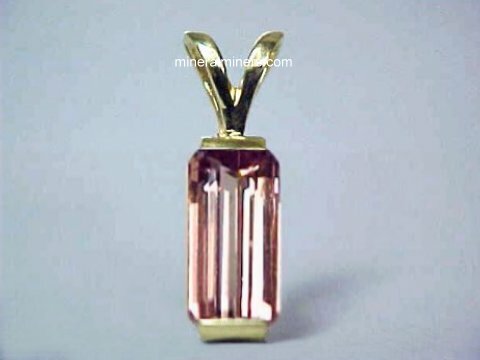 See also a side view photo of this genuine pink imperial topaz pendant. This 14k yellow gold imperial topaz pendant is set with a genuine imperial topaz gemstone weighing 0.90 carats. This pink imperial topaz gem was faceted from a natural imperial topaz crystal that was mined at Ouro Preto, Brazil. 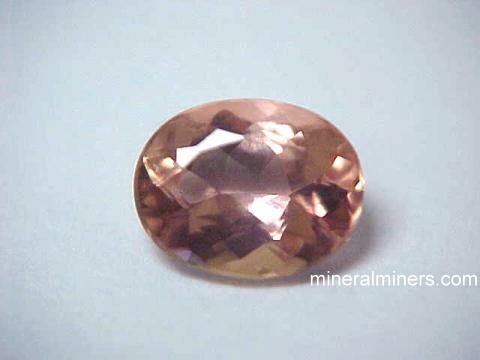 This gem originally had natural orange-pink color, and it was then gently heated to remove the orange color component, leaving only the natural rich pink color. This beautiful pink imperial topaz gemstone is eye clean under very close inspection. It was very well cut with excellent brilliance. This beautiful imperial topaz gemstone will make a wonderful pink imperial topaz necklace! See also a side view photo of this genuine pink imperial topaz pendant. This 14k yellow gold imperial topaz pendant is set with a natural imperial topaz gemstone weighing 1.56 carats. The color is a fine reddish-orange natural color. This unique imperial topaz gemstone is unheated and untreated, it will make a very fine imperial topaz necklace. 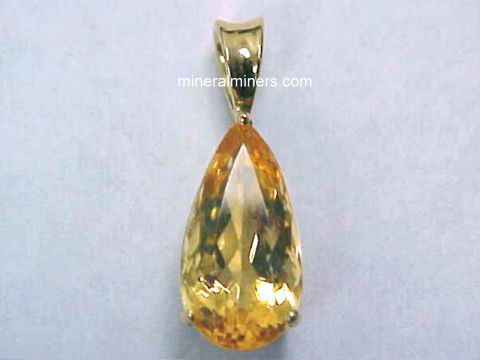 The natural color imperial topaz gem in this pendant is eye clean and well cut. This beautiful topaz gem was faceted from a genuine imperial topaz crystal mined at Ouro Preto, Brazil. See also a side view photo of this fine imperial topaz necklace design. This 14k white gold imperial topaz pendant is set with a natural imperial topaz gemstone weighing 3.06 carats. The color is a rich golden-orange natural color. This unique imperial topaz gemstone is unheated and untreated. It will make a very beautiful imperial topaz necklace! See another view of this natural color imperial topaz necklace design. 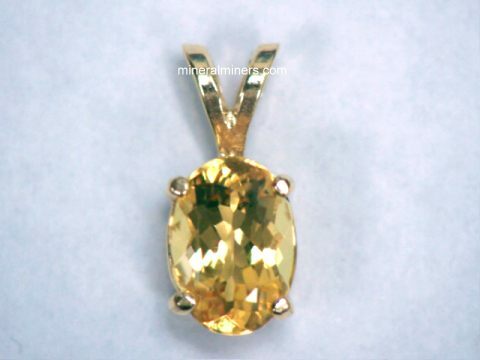 The natural color imperial topaz gem in this pendant is eye clean and very well cut with very good brilliance. This beautiful topaz gem was faceted from a genuine imperial topaz crystal mined at Ouro Preto, Brazil. See also a side view photo of this genuine imperial topaz pendant. This 14k white gold imperial topaz pendant is 21mm long (0.8 inches long). This unique imperial topaz pendant is set with a natural imperial topaz gemstone weighing 3.66 carats with fine orange-pink natural color. This unique imperial topaz gemstone is unheated and untreated, it will make a very fine and beautiful imperial topaz necklace! The natural color imperial topaz gem in this pendant is completely clean even under very close inspection and it is very well cut with very good brilliance. 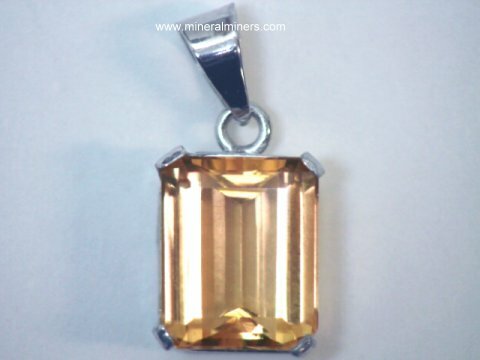 See a photo showing the superior brilliance in this natural color imperial topaz pendant. The current market wholesale price of this gem is over $800/carat! This beautiful topaz gem was faceted from a genuine imperial topaz crystal mined at Ouro Preto, Brazil. See also another view of this fine imperial topaz pendant. This 14k yellow gold imperial topaz pendant is 21mm long (0.8 inches long). This unique imperial topaz pendant is set with a natural imperial topaz gemstone weighing 3.11 carats with fine orange-pink natural color. This unique imperial topaz gemstone is unheated and untreated, it will make a very fine imperial topaz necklace! The natural color imperial topaz gem in this pendant is completely clean even under very close inspection and it is very well cut with very good brilliance. The current market wholesale price of this gem is around $600/carat! This beautiful topaz gem was faceted from a genuine imperial topaz crystal mined at Ouro Preto, Brazil. See also another view of this fine imperial topaz pendant. This 14k yellow gold imperial topaz pendant is set with a natural imperial topaz gemstone weighing 1.75 carats. The color is a very strong orange natural color. This unique imperial topaz gemstone is unheated and untreated, it will make a very beautiful imperial topaz necklace. See another photo of this natural color imperial topaz jewelry design. The natural color imperial topaz gem in this pendant faces up eye clean with just a few very faint natural inclusions visible under close inspection. This beautiful topaz gem was faceted from a genuine imperial topaz crystal mined at Ouro Preto, Brazil. See also a side view photo of this genuine imperial topaz pendant. This 14k white gold imperial topaz pendant is set with a natural imperial topaz gemstone weighing 3.46 carats. The color is a rich golden-orange natural color. This unique imperial topaz gemstone is unheated and untreated, it will make a wonderful imperial topaz necklace. 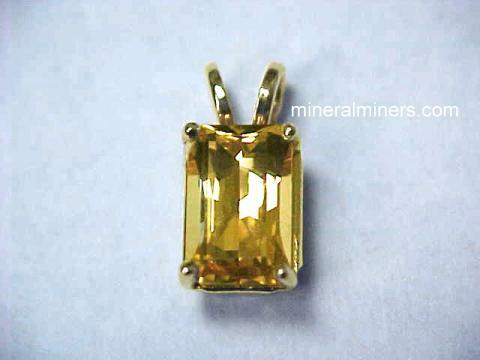 The natural color imperial topaz gem in this pendant is eye clean and very well cut with very good brilliance. This beautiful topaz gem was faceted from a genuine imperial topaz crystal mined at Ouro Preto, Brazil. See also a side view photo of this genuine imperial topaz pendant. This 14k white gold imperial topaz pendant is set with a natural 2.83 carat pink imperial topaz gemstone, and with a 0.03 ct. natural fancy pink color accent diamond. The imperial topaz is a beautiful pink color under incandescent light as shown at the left. Deep pinkish orange topaz is usually heated gently to achieve this color. This fine quality imperial topaz gem is completely eye clean. It was very well faceted from a genuine imperial topaz crystal mined at Ouro Preto, Brazil. See also another view of this imperial topaz pendant. This 14k white gold imperial topaz pendant is set with a natural 2.66 carat imperial topaz gemstone and a 2.8mm (0.09 ct.) natural fancy orange color accent diamond! The imperial topaz is a beautiful orange-gold color under incandescent light as shown (100% natural color - it is unheated and untreated). This fine quality imperial topaz gem is completely eye clean. It was very well faceted from a genuine imperial topaz crystal mined at Ouro Preto, Brazil. See also another view of this natural imperial topaz pendant. This 14k white gold imperial topaz pendant is set with a natural 2.22 carat imperial topaz gemstone and a 2.4mm (0.06 ct.) natural fancy deep orange color accent diamond! The imperial topaz is a beautiful deep reddish orange color under incandescent light as shown (100% natural color - it is unheated and untreated). This fine quality imperial topaz gem is completely eye clean. It was very well faceted from a genuine imperial topaz crystal mined at Ouro Preto, Brazil. See also another view of this natural imperial topaz pendant. This 14k white gold imperial topaz pendant is set with a natural imperial topaz gemstone with very rich golden-orange color (100% natural color - it is unheated and untreated). This beautiful imperial topaz gem is completely eye clean, even under close inspection. This lovely pendant will make a very beautiful imperial topaz necklace! The fine golden-orange color imperial topaz gem in this pendant was very well faceted from a genuine imperial topaz crystal mined at Ouro Preto, Brazil. See also a side view photo of this natural color imperial topaz jewelry design. This 14k yellow gold pendant is set with a natural imperial topaz octagon cut gemstone with natural golden color as shown (100% natural color - this natural imperial topaz gem is unheated and untreated). This beautiful gem of genuine imperial topaz has faintly visible natural inclusions. It was faceted from a natural imperial topaz crystal mined at Ouro Preto, Brazil. This lovely 14k gold pendant will make a wonderful topaz necklace! This large topaz gemstone has very beautiful medium sky-blue color. 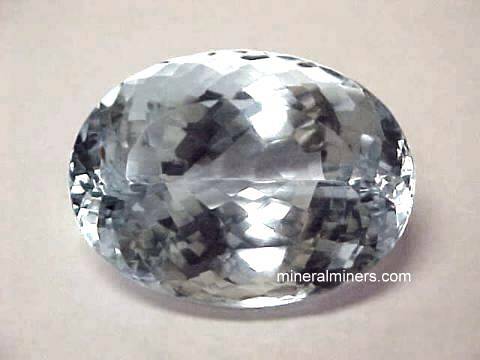 It was faceted into this oval shaped gem from a topaz crystal that was mined at Marambaia, Brazil. This lovely shade of blue looks just like a very expensive aquamarine gemstone! This fine quality topaz gemstone is completely clean inside even under close examination with magnification under bright illumination (GIA: Type I Gem, Flawless Clarity). This beautiful sky-blue topaz gem is very well cut with excellent brilliance. This lovely silver topaz gem shows a beautiful bright silver color with a hint of very pale blue (natural color) and it has fantastic brilliance! This gem was faceted from natural topaz rough mined at Marambaia, Brazil. This silver topaz gemstone is completely colorless, and it faces up eye clean. Under very close inspection, it shows two tiny natural inclusions right on the girdle which absolutely guarantee its natural origin (GIA: Type 1 Gem, VS/SI Clarity). This topaz gemstone is very well cut with excellent brilliance. This wonderful collector gem was expertly faceted from a natural topaz crystal that was mined at Marambaia, Brazil. See also a side view of this silver topaz gemstone. This rare quality collector size topaz gemstone is almost completely colorless with a very faint trace of silvery-blue natural color. It is totally clean facing up, which is very rare for such a large natural topaz gemstone, and under close inspection with bright illumination it has just one very faint small needle-like natural inclusion which absolutely guarantees its natural origin (GIA: Type I Gem, VS Clarity). This wonderful natural color topaz gem is well cut with good brilliance from a natural topaz crystal that was mined at Marambaia, Brazil. This beautiful topaz gem has a light sky-blue color. It was faceted from a topaz crystal mined at Marambaia, Brazil. This beautiful topaz gemstone has pale sky-blue color. It looks like an expensive aquamarine! This fine quality topaz gem faces up eye clean (GIA: Type 1 Gem, VS). This triangular shaped gem is very well cut with excellent brilliance from a topaz crystal that was mined at Marambaia, Brazil. This extra large topaz gemstone has very light sky-blue color. It looks just like a huge aquamarine gem! This beautiful topaz gemstone faces up eye clean (GIA: Type 1 Gem, VS), and under close inspection with bright illumination it shows a few tiny natural crystal inclusions and just one very faint needle-like natural inclusion which absolutely guarantees its natural origin. This superior quality gem is very well cut with very good brilliance from a topaz crystal that was mined at Marambaia, Brazil. See also another view of this wonderful topaz gemstone. This wonderful topaz gemstone is faceted in a trillion cut with pale sky-blue color. It does look like an expensive aquamarine. This fine quality topaz gem faces up eye clean (GIA: Type 1 Gem, VS), and under close inspection with bright illumination it shows a tiny crystal inclusion under the crown facets which absolutely guarantees this beautiful gem's natural origin. This triangular shaped gem is very well cut with excellent brilliance from a topaz crystal that was mined at Marambaia, Brazil. This beautiful topaz gemstone is faceted in a rectangular cut with light sky-blue color. It looks like a very expensive aquamarine! This fine quality topaz gem is flawless under magnification (GIA: Type 1 Gem, Flawless). This rare quality gem is very well cut with very good brilliance from a topaz crystal that was mined at Marambaia, Brazil. This fine quality topaz gemstone has beautiful very light sky-blue color. It looks like an expensive aquamarine! This rare quality topaz gem is completely clean even under very close inspection with bright illumination and magnification (GIA: Type 1 Gem, Flawless Clarity). This oval shaped gem is very well cut with very good brilliance from a topaz crystal that was mined at Marambaia, Brazil. This unique topaz gemstone has light to medium sky-blue color. This beautiful topaz gem is eye clean with a few tiny pinpoint natural inclusions visible under close inspection with bright illumination (GIA: Type 1 Gem, VS Clarity). This triangular shaped gem is very well faceted with good brilliance from a topaz crystal that was mined at Marambaia, Brazil. See also a side view of this amazing extra large topaz gemstone. This unique topaz gemstone has light to medium sky-blue color. It is totally clean facing up even under very close inspection with bright illumination, which is very rare for such a large natural topaz gemstone, and under close inspection from the backside with bright illumination it shows two small faint natural inclusions which absolutely guarantee its natural origin (GIA: Type 1 Gem, VS Clarity). This 1.6 inch long drop shaped gem is very well faceted with excellent brilliance from a topaz crystal that was mined at Marambaia, Brazil. This unique topaz gemstone has medium sky-blue color. It is totally clean to the eye even under very close inspection, which is very rare for such a large natural topaz gemstone (GIA: Type 1 Gem, VS Clarity). This pear shaped gem is expertly faceted with excellent brilliance from a topaz crystal that was mined at Marambaia, Brazil. This beautiful topaz gemstone has light sky-blue color. It is totally clean even under very close inspection with bright illumination and magnification, which is very rare for such a large natural topaz gemstone (GIA: Type 1 Gem, Flawless Clarity). This pear shaped gem is expertly faceted with excellent brilliance from a topaz crystal that was mined at Marambaia, Brazil. This unique topaz gemstone has light sky-blue color. This fine quality gem is completely eye clean, which is very rare for such a large topaz gemstone (GIA: Type 1 Gem, Clarity Grade: VS). Under very close inspection with bright illumination, this topaz gem shows very faint needle-like inclusions which absolutely guarantee the natural origin of this topaz gem. This extra large size triangular cut gem is expertly faceted with good brilliance from a topaz crystal that was mined at Marambaia, Brazil. This extra large size topaz gemstone has light sky-blue color. This beautiful collector gem is totally clean even under very close inspection with bright illumination, which is very rare for such a large natural topaz gemstone (GIA: Type 1 Gem, VVS Clarity). This pear shaped gem is very well faceted with very good brilliance from a topaz crystal that was mined at Marambaia, Brazil. This unique topaz gemstone has light to medium sky-blue color. This wonderful shade of blue looks just like a very expensive aquamarine gemstone! This fine quality topaz gemstone is totally clean even under very close inspection with bright illumination (GIA: Type 1 Gem, VVS Clarity). This rectangular shaped gem is very well faceted with good brilliance from a topaz crystal that was mined at Marambaia, Brazil. This beautiful topaz gemstone has medium sky-blue color. It does look like a very large and very expensive aquamarine! This rare size collector gem of genuine topaz is flawless (GIA: Type 1 Gem, Flawless Clarity). Under close inspection with bright illumination and magnification it shows no inclusions! This large size topaz gem is very well cut with very good brilliance. It was expertly faceted from a topaz crystal that was mined at Marambaia, Brazil. See also a side view of this large flawless topaz gemstone. Flawless Sky Blue Topaz Gemstone,109.82 carats! This beautiful topaz gemstone has medium sky-blue color. This superior quality topaz gem is flawless which is very rare for such a large natural topaz gemstone, and even under very close inspection with magnification and bright illumination it shows no inclusions (GIA: Type 1 Gem, Flawless Clarity). This oval shaped gem is very well cut with very good brilliance from a topaz crystal that was mined at Marambaia, Brazil. Extra Large Deep Sky Blue Topaz Gem, 127.56 carats! This amazing topaz gemstone has very deep sky-blue color. This superior quality topaz gem faces up eye clean, and even under close inspection with bright illumination it shows just one natural inclusion - a very faint veil along one side that is not visible facing up (GIA: Type 1 Gem, VS Clarity). This spectacular collector gem is very well cut with very good brilliance from a topaz crystal that was mined at Marambaia, Brazil. This large size topaz gemstone has medium dark sky-blue color. This shade of blue looks just like an expensive aquamarine gem! This beautiful gem is completely clean, even at 10 x magnification. (GIA: Type 1 Gem, Eye-clean Clarity). This Large sized emerald cut shaped gem was very nicely fashioned with good brilliance from a topaz crystal that was mined at Marambaia, Brazil. This large size topaz gemstone has medium dark sky-blue color. This shade of blue looks just like a very expensive aquamarine gem! This beautiful gem faces up completely clean, with minor flaws visible only with magnification. (GIA: Type 1 Gem, Eye-clean Clarity). This Large sized pear shaped gem was very nicely fashioned with good brilliance from a topaz crystal that was mined at Marambaia, Brazil. This large size topaz gemstone has medium dark sky-blue color. This shade of blue looks just like an expensive aquamarine gem! This beautiful gem faces up clean with minor flaws visible with magnification. (GIA: Type 1 Gem, Eye-clean Clarity). This Large sized emerald cut shaped gem was very nicely fashioned with good brilliance from a topaz crystal that was mined at Marambaia, Brazil. This large size topaz gemstone has medium dark sky-blue color. This shade of blue looks just like a very expensive aquamarine gem! This beautiful gem faces up completely clean, with minor flaws visible only with magnification. (GIA: Type 1 Gem, Eye-clean Clarity). This Large sized oval shaped gem was very nicely fashioned with good brilliance from a topaz crystal that was mined at Marambaia, Brazil. See also our pages displaying colorless Topaz Crystals and natural color pale blue natural color Topaz Mineral Specimens, available in sizes from thumbnails up to large cabinet specimens and museum grade crystals! 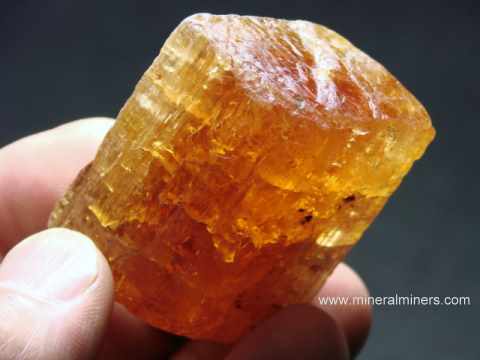 Every one of our imperial topaz crystals is completely natural, and they were all found at Ouro Preto, Brazil. We also have a selection of colorless topaz crystals & golden topaz crystals, and some of our topaz crystals have pale blue color. These blue topaz specimens are rare natural color blue topaz crystals that were found in Minas Gerais, Brazil. We do not heat or treat any of our topaz crystals. Here at mineralminers.com, we do not have any heated or treated topaz crystals, each crystal is 100% natural color! We specialize in fine quality natural color topaz crystals, some even have gem grade transparency! We do have more imperial topaz crystals in stock, including some rare size large imperial topaz crystal specimens. We also have inexpensive topaz specimens available. These small topaz mineral specimens have special volume discounts as well! We also have a large variety of superior quality natural color golden topaz jewelry & imperial topaz jewelry designs available in earrings, pendants and necklaces. We specialize in Collector Quality Topaz! 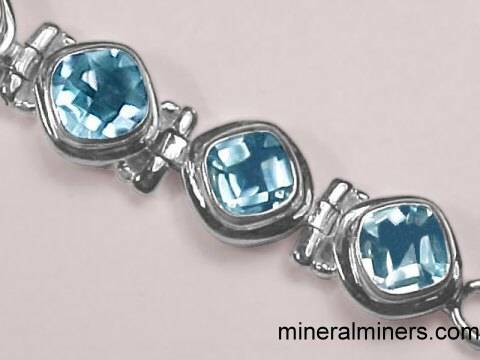 See also our page displaying Topaz Gemstones. We have a large selection of different cuts and sizes available in blue topaz gemstones including extra large giant size collector gems! Our topaz jewelry items are handcrafted in both 925 sterling silver and in 14k gold, with a large selection of topaz earrings in both leverbacks and in stud earrings. 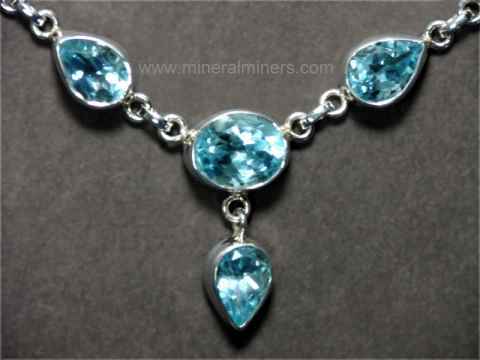 We offer a very large variety of different styles and sizes in genuine topaz necklaces. We do have more inventory of natural imperial topaz crystals in stock. Information about genuine topaz and its history, physical properties, chemistry, occurance, and metaphysical uses is displayed on our topaz information page. To see more topaz photos, just select another linked image displayed below. We have naturally terminated crystals for a very large variety of minerals including fine pegmatite matrix specimens with gem tourmalines, beryls, spodumenes, and topaz! See our page with links to collector quality crystals and mineral specimens of all mineral varieties! 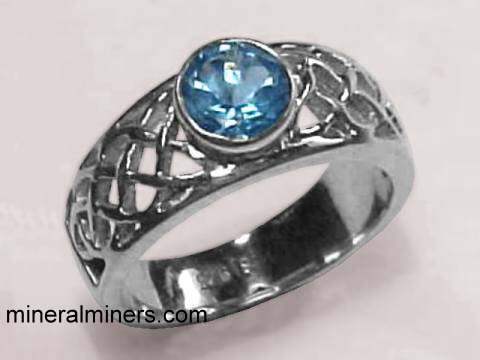 Would you like us to inform you when we add on this page more natural topaz collector quality items? We have a large inventory of natural color topaz items of rare and fine quality in stock, so be sure to let us know if you have any fine topaz special requests. Please contact our webmaster or our 'site' geologist with any questions or comments.